When I started birding in the 1970s, I cut my bird teeth with a pair of pre-war porro-prism bins formerly owned by my grandfather. We learnt our birds from first principles and the hard way. A scope was a thing of dreams, a piece of miraculous equipment wielded by the elite of the birdwatching fraternity – the badge of a master birder. Occasionally, my birding friend and I would ask to borrow a quick look through one of these beauties, as I recall, to see my first Broad-billed Sandpiper and Temminck’s Stint on the North Kent Marshes. Times have changed, and now even fledgling birdwatchers come ready-equipped with a scope. 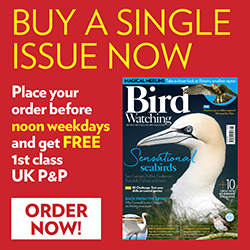 And rightly so, because the difference a good scope can make to your enjoyment of birdwatching is immense. The quality of scopes has improved beyond belief, too. Indeed, it has reached the stage when we are speculating whether the scope has reached the limit, that ultimate stage where the (if you’ll excuse the expression) glass ceiling is reached and it is physically impossible to make them any better. If that time is approaching, it is not coming before some of the main players at the cutting edge of scope manufacturer have had more than a decent stab at improving the best. 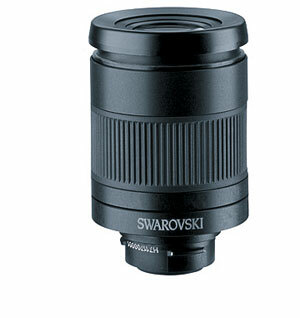 And so we come to the latest incarnation of Swarovski’s rubber-armoured birding scope. I was luckily enough to be invited in mid-May, to join a group of birders, digiscopers, photographers and journalists to the steppes and mountains of Kazakhstan to test the new Swarovski scope, its brand-new wide-angle eyepiece and the company’s new design of digiscoping adapter. The first thing that strikes you about this set-up, before you have even used it, is its weight - or lack of it! The body has been made with magnesium to keep it as light as possible and it shows. My shoulders never once complained. 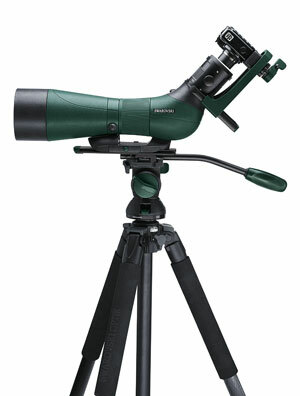 Despite that, the scope shares the comfortable, sturdy, well-built feel of its predecessor. And I am ashamed to admit that I foolishly allowed my model to crash to the ground twice - but with absolutely no ill-effects. In line with the fact that the optical envelope has almost been pushed as far as it will go, the optics are superb. The image is bright, colour-true and crisp to the edge. There is drama and three-dimensionality in every view. Most striking of all was the performance of the zoom eyepiece. Let’s make this clear, I hate zooms. Or rather, I thought I hated zooms. I used to believe they give a nasty, tunnel vision image, and leave me just dying to see beyond the boundaries of the image. The new wide-angle zoom I used in Kazakhstan was astonishing, though. Throughout the trip, throughout the range of magnification, I never once thought of tunnels, never felt I was getting short-changed on field of view. Though I mostly used it a lower magnifications, when I turned the silky smooth zoom to higher mag, I wasn’t aware of losing quality and didn’t feel that extra enclosure of the expected tunnel. And the quality of resolution and brightness stood up very well to zooming. Digiscoping was a piece of cake, producing very bright, crisp, feather-perfect images with the minimal of effort. It is a minor gripe, but when zooming the scope needs considerable refocusing. I don’t know if it is possible to get round this optically, but it made relocating distant birds I’d zoomed to slightly tricky. The helical focusing mechanism was of course very smooth and easy, so refocusing was hardly a chore. In summary, a brilliant, lightweight scope of the highest standard. The wide-angle zoom was a revelation which could even convert a diehard fixed-mag eyepiece birder like me.